I have some exciting updates on public art projects in Ann Arbor. Okay, now that you’ve done that, fellow artists, on to the news! Last time we got together, I went over some of the projects in the pipeline. The Coleman Jewett memorial has been fully funded, largely through private donations. We’ll have a date for installation sometime soon, and the city is now looking into the specifics. The memorial will be two bronze Adirondack chairs installed at the Farmer’s Market in Kerrytown. Artists’ Description: The name is in reference to the movement and occasional turbulence of the river and the history of hydroelectricity generated by the river. The following were selected by the jury. Canoe Fan is the installation that the city only has for a certain period of time. Artist’s Description: Aluminum canoes create a half circle fan form that calls to mind the sun on the horizon, a woman’s hand held fan, a Native American headdress, or the spread of peacock tail feathers. Artist’s Description: Two vertical half canoe sculptures to be placed near the Huron River with a built-in seat to accommodate one or two people. Artist’s Description: Tulip will be constructed from ten canoes standing vertically meeting at one point in the center. PowerArt! public selections were made, and will start being installed in the month of May 2015 in downtown Ann Arbor. These will wrap power boxes, and the location is included. I was on the jury for this, and have some comments about the sentiment and process that went into some of them. There are potentially two more phases for this project, so please consider submitting for the next round; there was a $1500 stipend to the artists whose works were selected this time. The following two were selected by the public. The jury unanimously liked Show Horse 1. Tropicali is my personal favorite, and I believe it will be installed on a power box that I used to look at quite often from my apartment on S. Forest in University Towers as an undergraduate. The jury is curious to see how the public will react to A Fly Stopped By. I wish I could remember more of the discussion around Traffic Light 1, but we all were fans. And still it will be wonderful was somewhat controversial, but we felt it was thought provoking and offered dynamism as you moved around the box to view it. And David Zinn wins for most completely thought-out rendering with Selfie Monster. Finally, Art in the Sky is under way, and I encourage you to submit a design for the water tower that I see every day when I go to and from work, when I run through County Farm Park… make it interesting! I hope you enjoy — there is more to come. 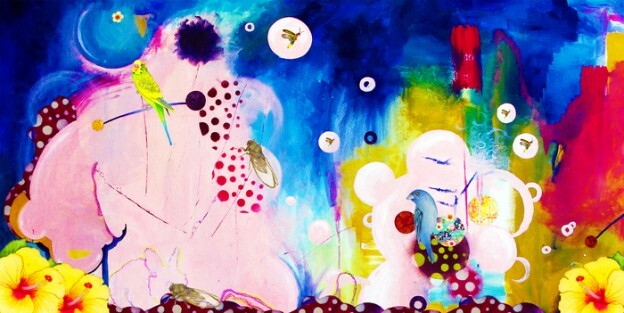 This entry was posted in Ann Arbor, Art on May 7, 2015 by admin. Every other Monday, I usually watch Ann Arbor City Council meet while tweeting commentary under the hashtag #A2Council. It’s kind of like Pokemon, but without the fun names. For those of you who are annoyed by it, my apologies. Tonight’s an off week, so I thought I’d write about other ways to engage the city besides throwing tomatoes. I recently attended a local “unconference” for people who want to make a difference in their community. There were a number of different tracks, and I chose to participate in the civics track. I heard a lot of great ideas, one of which I’d like to highlight, and two other things outside the conference that I’d like to share. If you care about civics in Ann Arbor, please consider making a donation to CivCity, the next project of Mary Morgan, one of the founders of the Ann Arbor Chronicle. The Chronicle has been an indispensable tool when it comes to researching decisions made by city council and the various commissions in the city. Ultimately, I’d like to see the city be able to offer the kind of transparency the Chronicle brought, but in the meantime, CivCity is a great followup. Did you know Ann Arbor has an online forum to solicit input from the public about different topics? No? Welcome to the club of almost everyone in the city! Okay, maybe it’s just my usual club of me by myself, but in case you’re like me, it’s called A2 Open City Hall. Currently, they’re soliciting feedback regarding dog parks. Nobody has responded. You could be the first. You can participate in your city government! If you’re not ready to run for mayor or city council, there are boards and commissions you can participate in. The hardest part for me was figuring out how to get onto one. I shall lead you to the elephants’ graveyard. Decide you really want to devote an hour or two a month to civics. Don’t be a flake. Eventually, you’ll receive a notice in the mail if you’ve been confirmed to be on a board. Or, you can watch City Council live and hear your name and confirmation when and if it happens. Don’t blink. This entry was posted in Ann Arbor, Politics and tagged Ann Arbor, boards, city council, civcity, commissions, open city all, twitter on February 9, 2015 by admin. Does Ann Arbor still have a public art commission? A quick recap: I was appointed about a year ago, during the same city council meeting where public art was de-funded—having an Irish sense of humor has proven useful. The one remaining big project from the old budget is the Stadium bridges project. There have been a couple of planning issues regarding lighting and foundations, but the plan is still for a late 2015 installation. If the art piece had been considered and chosen prior to construction, foundation and electrical work could have been done during construction. This is the idea behind “baked-in” funding for art. There are three other projects the commission is involved with, and a new one for an elevated water tank on Manchester Road in Ann Arbor. The Jewett memorial is a set of bronze adirondack chairs to be installed at the Ann Arbor Farmer’s Market commemorating Coleman Jewett, who was an admired local educator, and a fixture at the farmer’s market for years selling his chairs. This project is largely funded by private donations and grants, with commissioner Marsha Chamberlin acting as program manager. The project is nearly completely funded—”everything but the plaque”, and the city will be considering next steps soon. Canoe Imagine Art, which is being managed by the Arts Alliance. Three pieces have already been chosen, with one more to be chosen by the public from 3 finalists this February — I’ll be sure to share a link when I have one. The plan is for a public celebration in July 2015 to coincide with Huron River Days. The project differs from its initial conception in that the installations will be in Ann Arbor parks instead of scattered around downtown, and the parks will decide where they go. The city also reserves the right to keep them up. Commissioner John Kotarski was one of the jurors, and I concur with his delight in the quality of proposal submitted by artists. Most are interactive in some way, and will make a great addition to the parks. I’ve been selected to be a juror for another project managed by the Arts Alliance, “PowerArt!“. The first of three phases involves wrapping 8 traffic boxes around downtown Ann Arbor with canvases that display the work of local artists. The jury will select 6 submissions, and the public will select the remaining 2. Again, when I have a link, I’ll share it. The jury will take place in February, and the celebration will be in May 2015, followed by two months of community response before moving on to the next phases. The Manchester Elevated tank is up for repainting, which came up back in 2012 as a potential project in 2013. This is the first example of “baked-in” art, where the city identifies a project that may lend itself to public art prior to engaging the commission. The plan is very similar to the water tower on Plymouth road, where there will be a public request for designs, a jury will choose finalists whose submissions will be put to a public vote, with the winner being recognized. The commission had questions about the pros and cons of various materials (paint vs. vinyl), and made project suggestions that largely mirrored the previously successful project on Plymouth road. The project manager for the job will be handling the logistics behind managing design submissions, etc. This entry was posted in Advocacy, Ann Arbor, Art and tagged AAPAC, Ann Arbor, Art, Arts Alliance, Canoe Art, Canoe Imagine Art, PowerArt!, Public Art on February 2, 2015 by admin. Last weekend, I finally went through my own version of that pile. Some of the photos were taken in a small city called Ishikawa, the first place we lived in the central part of Okinawa, Japan. The city has since merged with other local municipalities into a larger city called Uruma, so it only exists in our memories. I remember the day my Dad told us we were moving to Japan: wow! Images of toys my friends had received as gifts from afar when their fathers were overseas sprang to mind: Hello Kitty! Transformers! Gundam! I thought about my aunt’s car, a Toyota… I thought about Godzilla. I remember being concerned as to whether or not there would be a Taco Bell. (No.) I thought about my friend Sherman, who was half Okinawan, and whose mother woke us up every morning chanting to Buddha at the family altar after I spent the night. I thought about the Karate Kid 2… would I see all those amazing things? Typhoons? Sliding doors? Tatami? Our flight there seemingly took forever, and not because it was halfway around the world. We were flying Military Airlift Command (MAC) on the Flying Tigers, so our flight went from Los Angeles to San Francisco, to Anchorage, and then finally to Kadena Air Base. I didn’t know for a couple more years that there were direct flights to Japan, and that the military basically considered us cargo. We were very tired when we arrived, blinking into the very hot morning. Amazing what you find when you search for “Karate Kid II Okinawa” — I don’t remember this part of the film. Riverstone? That sounds… very American. I didn’t need to worry. We looked at a few houses in “Riverstone”, far from any military installation, and chose the one on the hill overlooking a bay with the least amount of dead roaches in it. Of course, what we didn’t know was that they just hadn’t fumigated the place yet, and seeing it a few days later was disturbing: it was impossible to avoid stepping on a dead roach while walking around; it was like some avant-garde artist had decided to weave a floor from dead roach carcasses. Crunch, crunch, crunch. There’s an opportunity for a Björk video, there. Mercifully, the dead roaches were gone when we moved in, probably just swept out the door and onto the hill we lived on. Of course, at least one survived, and I had an epic, unconscious fight the first night we were in the house: I won, and found its massive carcass under the bed. It did not pass on its poison-resistant genes. Bleah. The view from our front yard. Friends lived in the house on the right, and I think the house on the left was a kindergarten of sorts, although I don’t ever remember seeing any children. And there probably weren’t environmental laws for whatever that plant is out there across the bay. As time passed, I learned to read and write Japanese, and learned that Ishikawa meant “stone river”, and finally, “Riverstone” made sense. 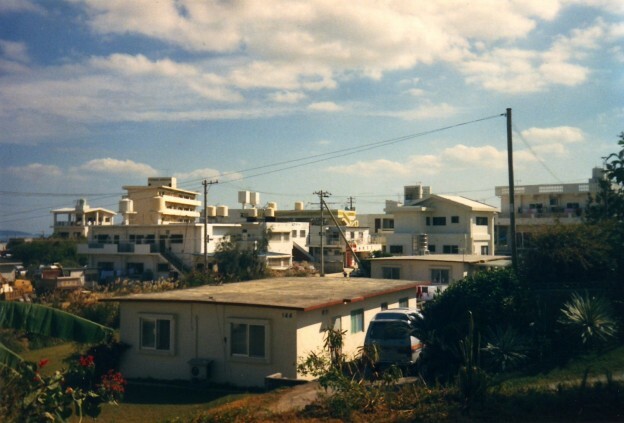 Okinawa didn’t seem to have zoning laws where we lived; we were surrounded by a mixture of houses, stores, a beach, sugarcane fields, the occasional vending machine conveniently located in the middle of a field, and tombs. Our neighbors were a mixture of Okinawans, American-Okinawan households, and a few Americans. Halloween wasn’t really celebrated, but the neighbors were willing to go along with it: I got rice crackers and seaweed. The road to town got a little wider while we lived there. The bus ride to school would take over an hour on occasion, and the route varied, depending on where families ended up living. Since there were Americans scattered in different places in town, they’d have the kids pile up in one place as best they could, but on occasion we’d stop next to a sugar cane field, and someone would hop on or off the bus. I spent a lot of time reading… and the extra hour in the morning was the perfect time to get last-minute homework done. Games with the neighbor kids were a learning opportunity: it’s funny how a game of tag can quickly teach you the words for “wait!”, “sorry!”, “run!”, “just kidding!”, and “sorry for running in front of your car grandma!” in a foreign language. And of course, I learned the coarse words of swearing and economics before anything else. You need to know what people are yelling at you, and how to buy candy, right? Happily doing my own thing, pretending to run my own apothecary in the backyard. Living in the country that was the source of Nintendo games was thrilling, and honestly, expedited my acquisition of Japanese as a second language. How else are you going to read the magazines and cheat books? We had weak air conditioning, and electricity was so pricey we had a flock of well-used fans scattered about the house. We had a barely functioning phone we rarely used—0989655135, and it always sounded like you were on the other side of the world no matter where you were—and heat came in the form of a kerosene room heater we moved around the house when necessary. Our house was built from concrete, which made it seem almost impermeable to the typhoons that would swirl outside—except for the hole in the ceiling in the bathroom, which was open to the world, and made it easy for all sorts of bugs and lizards to get into the house. While there’s no footage of me shrieking out of the bathroom after wrapping myself in a towel that included a gigantic, squirming roach, none of us will ever forget it. Following our street up the hill, you’d soon be met by rows of silent tombs. On the way to school and home, I walked by myself past tombs, sometimes in terrible downpours, and sometimes in the dark. There are moments in Miyazaki films where one feels a sense of haunted wonder—it’s the closest thing I can describe to what it was like. There’s a summer festival called Obon, like a Japanese version of the Day of the Dead, and just prior, families return to the family tomb to clean it in preparation. Whole tombs would emerge from what I thought were hills covered in grass! Offerings would be left, and the tombs would be decorated. It truly felt foreign. Shortly after moving there, and just before the school year started, I witnessed my first Obon performance. Okinawa’s Obon festival is slightly different from the mainland’s, and happens later in the summer. It was after dark, and I was in a neighbor’s yard, examining some weird plants, and I started my way towards home. I noticed a light coming from down the road, reflecting off the surrounding walls and earth. I crouched in some bushes as it approached, bearing a small parade of dancing people carrying lights and signs. I watched as they moved into the courtyard of a large mansion down the road. Suddenly, as though by magic, all the lights went on in the building, as though the revelers brought the house to life. I couldn’t believe it! I sat, mesmerized, feeling far from anything I’d ever known, but welcome in this far-off land. Blue skies, crazy power lines, heavy military aircraft: just another day. This entry was posted in Japan, Narcissism, Okinawa, Travel and tagged 80s, ishikawa, obon, okinawa, お盆, 旧盆, 沖縄, 石川市 on January 22, 2014 by admin. Ah, winter. I don’t quite loathe you just yet in this photo. That first year I experienced real snow (snow days!) and winter. I’d lived briefly in Virginia as a toddler and remember the snow, but it was still novel. The novelty finally wore off in the early 2000s, and I had to find a way to cope. You see, I like having seasons: in each season, we do different things, and so you appreciate each of them as they pass in contrast with each other. The long winter makes you appreciate spring that much more, and as the days grow longer and warmer, summer keeps us active outside until the late hours. At the peak of summer, the sun is out until 10:30 at night. And then the warmth begins to seem a bit fatiguing when fall settles in, bringing perfect sleeping weather, fires, the start of a new scholastic year, and a return of the nose to the grindstone. And then there’s Halloween, Thanksgiving, the winter holidays, and finally the new year! And then after a month or so, it’s bleak. Whatever St. Valentine’s Day, YOU ARE COLD. Some northerners depart the tundra for warmer climes for a week or two if they can. The closer you can place it to the end of the bleakness, the better, because when you return it seems like things are getting better, and you might just make it to another spring. This year, we returned to the land of my pre-teens, the high desert in southern California: Palm Springs, Yucca Valley and Twentynine Palms. 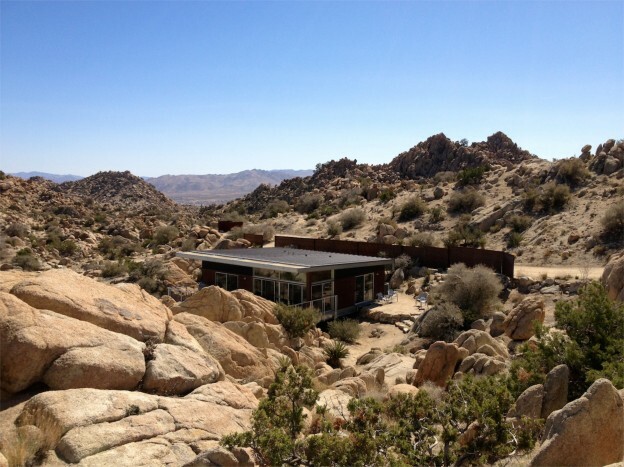 We decided to make the Rock Reach House in Yucca Valley our home for the duration of our stay. The April 2010 issue of Dwell magazine featured an article on pre-fab housing, and I was immediately envious of the fantastic home set in the desert. After searching around, I discovered it was available to rent on VRBO! The owners were genius: build an awesome home, and then rent it out while not in use! Three years later, I finally had the opportunity to stay in it. Specifically, it’s a basin-and-range desert, which is defined by abrupt changes in elevation, alternating between mountain chains that have flat, narrow valleys running through them. Historically, it’s been a sparsely populated area of the country, but the last twenty years have seen a large influx of people, a combination of retirees looking for warm weather and people looking for more affordable housing options. While there’s plenty of infrastructure, it’s not uncommon to find yourself turning off a paved road and driving through sand for a few miles to get somewhere. “It looks like the moon.”—someone who hasn’t ever been to the moon. The house is on 2.5 acres, and the features are spread out to enjoy. The setting, while looking somewhat alien and hostile, is very restful. With rare exception, it’s very quiet and still. There are several grocery stores (and one small local health food store), so lay in some supplies and head up the hill. The owners have thought of everything! There are flashlights where you might need them, switches to turn lights on at the start of a path, and more switches to turn them off at the end in case you want to view the stars. The landscaping is thoughtfully lit up at night, if you choose, and there are many places to hike and sit around the property. On top of it all, the house is very environmentally conscious and “green”, without ever really feeling like you’ve given anything up. The walk up to the house. Carport with our trusty Chevy Captiva—a Saturn Vue before they killed Saturn—the perfect vehicle for this trip. The blue chair is on a platform with a cool water soaking tub for especially hot days. View from the hot tub of: the house, the car port, and the neighbor across the way. It was amazing to sit and look up at the stars at night. Thousands and thousands of stars, stitching drawings together in the night sky. The inside of the house is very sleek, with concrete floors, modern furnishings, all the modern amenities, including Internet access. The floor plan was open: a living room, dining room and kitchen on one wall occupied half of the house, and the rest was divided into two large, equally sized bedrooms with a single bathroom in between. Awesome tree trunk slab table in the living room. I loved the ventilation hood in the kitchen: to turn on the fan and light, you simply pulled it forward. Elegant, streamlined and easy-to-use! It’s like being at home, but with all new appliances! Shallow, undermount sink on a vertrazzo counter. Mostly taking the pic for the counter, which is made from recycled glass. While there was plenty of beautiful wood, so many of the surfaces were made of nice wood that you need a coaster to set anything down, which made it feel a little less like home, and more like a museum—those were the moments where the fantasy sort of breaks down and you realize you’re in someone else’s home. In the morning, we’d wake to sun coming in the windows, a warm concrete floor and blue sky as far as the eye could see, and forget all about the coasters. It’s about three hours from the greater LA area, and an hour from Palm Springs. If you can fly into Palm Springs, it’s probably the best way. The PS airport is small, but nice, featuring outdoor walkways between gates, encased by glass. I remember it was just open to the world as a kid. The road to the house in Yucca Valley. Rent a small SUV if you can. You’ll be driving through the San Gorgonio pass, which is really windy, and then up through a twisty mountain pass near Morongo Valley, and then up a big hill into Yucca Valley. You go from about sea level to 3000 feet in 30 minutes or so. Once in Yucca Valley, you take Old Woman Springs Road up another thousand feet in elevation, turn left, and start offroading. After a few miles, lots of hills, twists and turns, you’re there! It doesn’t look so bad from here. If you decide to rent, the owners will send you a great writeup explaining everything about the place, and how to get there. And they note that GPS systems may have trouble finding the address, so it’s best you pay attention to the directions and map they provide. I recommend getting there by the light of day if you can, although it’s not impossible to do it at night: we did. This entry was posted in California, Travel and tagged dwell april 2010, old woman springs road, palm springs, pre-fab, pre-fab housing, rock reach house, twentynine palms, vrbo, yucca valley on April 20, 2013 by admin. Last year, I gave up Facebook for Lent—I’m not a practicing Catholic, but it has a few handy practices—and decided to keep a diary about the process. After two days, I realized I didn’t care enough to continue writing things down. Basically, the first few days were the hardest, like… breaking any habit. Interestingly enough, a paper I read on social interaction design commented that it takes 3 days to come off social media habits. While I couldn’t find a cite for it, it does seem to hold true for me. Facebook, Twitter, Pinterest and their ilk are desire engines. Effectively, despite all your rage, you’re still just a rat in a cage. It’s no longer enough to dazzle people to get attention; instead, sites and products must instill habit, and they do. Fortunately, there are ways to break habits by recognizing exactly what it is they reward. The next day was 12/21/2012. Arguing about gun control and posting crappy images, one way or another, immedately after Sandy Hook seems really, really tactless if you go review it all now. The next time some free social media service changes their Terms of Service, give them a few days before you react… chances are they’re just not thinking particularly clearly. They’re not geniuses, they’re just people like you and me. Google something before posting it as truth, especially if it seems pretty fantastic. People check in via texts and messages when they notice you’re gone; that’s nice. It takes a bit to shake firing up Facebook when you get bored or frustrated. I use Facebook to keep on top of current events; moreso than news websites: regular news websites have their own (entertainment) agenda and can be slower than Facebook. Facebook messages, while sometimes spotty, can be more reliable than regular email. I missed seeing my family. I occupied myself, e.g. finishing all those online articles I meant to read later. I felt like time slowed a bit, because life was more quiet. I recommend the experience. Another friend is doing it for a year, which is pretty impressive. I’ll miss him, but I’ll just have to find him in person to see how life is going. Personally, I’m going to limit myself, but I’m not quite sure how, yet. I like being connected to people, so how often? Once a day? Once a week? What do other people do? This entry was posted in Narcissism, Technology and tagged Facebook on January 1, 2013 by admin.